Inspired by conversations on the FOOD52 Hotline, we're sharing tips and tricks that make navigating all of our kitchens easier and more fun. Today, A&M learn how to brew a perfect pot of tea. Not all teas are created equal. We've been treating all varieties of tea pretty much the same way, which has led to some less-than-stellar cups. Lucky for us, Heidi Johannsen Stewart from Bellocq Tea Atelier came over to teach A&M exactly how to brew a perfect pot of tea. Never will we suffer through an over-steeped and bitter cup again -- and neither will you! 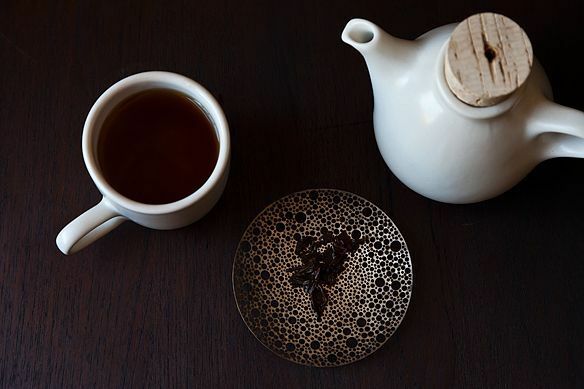 Interested in Bellocq tea? Check out our shop offer featuring their gorgeous loose-leaf blends. This week's video was shot by our friend Alex Lisowski and edited by Kyle Orosz. Very nicely done! I'd like to offer up one of our customs, growing up in Eastern Europe. In addition to using loose leaf (it was always cheaper than the bags), prewarming the pot and not forcibly stirring it, we always poured back the first cup of tea into the pot and let it sit for a few moments. This allowed us to see if the tea was ready and also gently equalized the layers of tea in the pot. I still do it when making a pot of tea. Why buy beautiful, expensive loose leaf tea and use a bag? Let your tea leaves be free! They infuse more fully when they can expand freely. You can pour through a strainer held over your cup if you don't like stray leaves in your mug. It should appear (it just did for me) -- maybe try re-loading the page? I just came across this video while searching the Ted M tea strainer... Heidi did such a great job! I loved watching her hands.. so expressive and so interesting. who knew all that regarding temperature! Thanks guys! Heidi did such a great job, and she really has improved my life in tea. Glad you enjoyed this, Andrea! When I lived in China, I found that they made tea in a multitude of ways. The way, I seemed to gravitate more to was gaiwan, or cup and lid. Basically, a small handle-less cup and a small lid, the lid keeps the tea hot, and is used as a strainer to keep the tea leaves out of your mouth. It works brilliantly and since its individually sized you never have too much or too little. Like the guest mentioned in the video, you can steep the tea many times before it loses its flavor completely. I also saw, gongfu (phonetic) preparation, but its a bit more rare to see, as its the traditional way of brewing, thus more labor intensive. They also had a special brewer that could hold water and leaves in a sort of small hopper, you would then steep and set the device atop your cup and press a button that would release a stopper, which would allow the tea to flow into the cup. Sounds more complicated that it actually was. Different strokes, I guess. I England we have a few rules for the brewing of BLACK tea, which pretty well guarantees a 'perfect' cup of tea. 1. Always use loose leaf tea if at all possible, avoid all forms of 'bag' tea. One teaspoon for each person, plus 'one for the pot'. 2. Temperature of the water is critical. The optimum temperature for black tea infusion is 100C. Hence the saying 'bring the pot to the kettle, never the kettle to the pot'. The brief time it takes for the water to go off the boil is enough to affect the flavour. By the same token, the pot should be pre-warmed to keep the infusion temperature as high as possible. 3. Allow to stand (or 'mash' or 'draw' 'brew') for 5-7 minutes. do not stir vigorously. 4. Pour and enjoy! I prefer mine with a dash of fresh milk and a spoon of white (not brown) sugar but each to his own! I have to second the Breville tea maker, yes, best received as a gift. For years I jealously watched my husband cruise down to the kitchen to his ready-for-him-fresh-in-the-morning cup(s) of coffee. Then, enter the Breville. I set and forget. Auto start, customary brew time/temp, plenty of presets for whatever tea mood hits you, and keep warm at whatever temp you wish. Ahhhhhh. And the auto-dunking basket is a riot. While the morning is great for fresh tea, I find that coming home to a perfect cup is almost better. No more auto envy here! Great video. I would add if you are going to go through the trouble of procuring some good loose leaf tea and spring water, then do the rest of it correctly too. Get a cheap kitchen timer to prevent your 5 minute brew to become 10 minutes because you are busy watching TV. Also, I would recommend a thermometer to know when the temps have dropped , or better yet, get a Breville kettle. They are expensive buy can heat up water to 5 different temperatures, all of which are coffee and tea friendly. I noticed Amanda is using a Breville kettle in the video, but I am not sure if she has the temperature model. Finally, get a scale. The old idea of using a teaspoon (despite the name) for everything is outdated. There are 100's of types of teas with really wild shapes and sizes. Weight is always better. I figure about 3 grams for an 8-10 oz cup. Once you have everything in place, it really is trivial to do. It only sounds involved. It's from Ted Muehling. http://www.tedmuehling.com/ -- It's best to receive it as a gift, as you'll see! I want to know where you can get that tea strainer and what name does it go by?